The two weeks after the Galston Gut Buster flew by so quickly. I was very excited when my parents and I set out for Canberra on Saturday morning; the race started early on Sunday. In terms of tapering, I certainly took carb loading to heart in the week leading up to the race which included Easter and my birthday. We stopped in Goulburn for lunch and after a very generous meal I was a little worried that my body would forget how to run after so much indulging. After a restless night, race morning arrived and I was ready to tackle those 42.195kms. 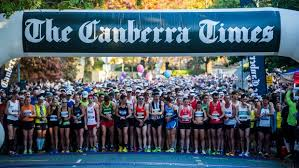 I was surprised at how warm it was around 6am in Canberra, having initially been concerned that I hadn’t done any training in colder weather. I really enjoyed the first 10kms of the race, I decided to keep the 4:30 pacer in sight and see where it would take me. At this point in the race I was full of energy and couldn’t believe I was running my first marathon. The sunrise was beautiful behind Parliament house, and it was a very surreal feeling for me to finally be here after 6 months of training. As the race progressed, I realised that I have always struggled to keep even splits in training as I tend to start faster and slowdown in the last 10kms or so, and the marathon was no exception. I managed to hold on to the 4:30 bus until about 26kms, where I stopped a little longer at the water station and realised that I would not be able to keep that pace for another 16kms. My legs were hurting, and I was regretting not stretching more at the start line. I felt a slight hip flexor niggle right from the beginning, and by the 26km mark this had become quite painful and lifting my right leg was not pleasant. I had a mini mental crisis here, and looking back probably ‘hit the wall’. I was tempted to walk, but knew that it would be incredibly difficult to start running again, both physically and mentally. I pushed through and reminded myself that it was my first marathon and after all, my main goal was to finish! I knew that I could do that and stopped looking at my watch every three seconds and concentrated on putting one foot in front of the other. The last 10km were painful, but made so much better by the encouraging volunteers and race marshals. Despite the fact that everything was hurting, I was delighted to be finishing my first marathon. With the finish line in sight, I gave it my all and sprinted to the end, happy with a solid effort. My time was 4:35:09. I finished, well under five hours and closer to 4:30 than I expected. Even though I could barely walk, I was one happy marathoner! While I enjoyed the course, I found that pounding the bitumen was quite harsh on my joints and I definitely appreciate trail running a lot more. I would like to do another road marathon this year as well as many more trail events. I have a newfound respect for marathon and ultra-runners. This entry was posted in by Alice Kucera, The Bushrunner. Bookmark the permalink.